For months now the Center for Media and Democracy (CMD) has been submitting FOIA requests to Wisconsin lawmakers. They have requested emails to/from legislators and the American Legislative Exchange Council (ALEC). These requests for documentation is in pursuit of transparency…to determine model legislation emanating from ALEC that is introduced in Wisconsin. 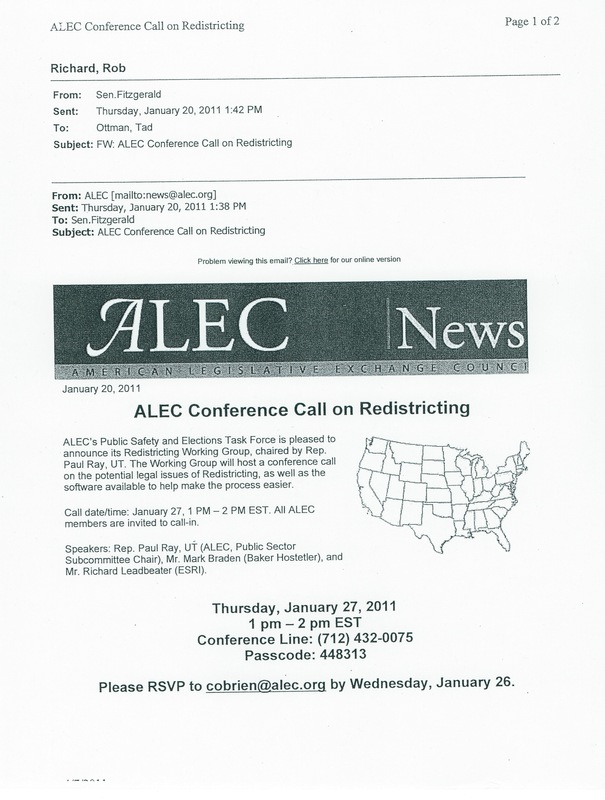 In addition, CMD asked for materials that would be distributed by ALEC at their Spring Task Force Summit this week in Oklahoma City, Ok.
“Despite ALEC trying to spin itself as a “transparent” organization, ALEC records have miraculously been disappearing from legislative offices and the organization is engaged in a box drop dodge to avoid disclosure. But while ALEC legislators are meeting behind closed doors with corporate lobbyists, citizens will be rallying in the streets raising awareness about how ALEC’s agenda favors large corporations at the expense of average Americans. Someone needs to have a heart-to-heart with ALEC’s new PR Director, Meierling and provide him with Webster’s definition of “transparency.” Nothing about ALEC is transparent – as we have come to understand after several years of research and investigation. For this an other reasons, demonstrations, marches and union organized events protesting ALEC are being planned for this week in OK. City. VLTP would urge those located near OK. City to attend and lend their voices to the ALEC inspired protests this week. In order to keep readers with an interest in ALEC up to date on stories related to ALEC, we’re posting this page with brief descriptions of ALEC activities and links to the articles or material(s). Included this update are links to measures or articles published by ALEC (if available) , showing their take on issues. Simply click on the title and a link will take you to the full article(s). A decision by the South Dakota legislature’s Executive Board to possibly include paying for trips to American Legislative Exchange Council meetings has created some controversy. ALEC as it is known has advocated for major changes in public education and the role of government. Senator Dan Lederman of Dakota Dunes, a republican, has been a member of ALEC for some time. “When McCrory appointed Pope as his budget director in 2012, many progressives in the state feared sweeping tax cuts were on the way. The governor has been mostly silent, so far, but the three Pope-tied groups have each released their own highly regressive tax plans. Did Johnson & Johnson succumb to ‘race baiting’? “A conservative policy expert recently attended Johnson & Johnson’s annual shareholder meeting last week where he challenged the company for caving to left-wing extremists and deciding to stop working with mainstream conservative organizations. “At Thursday’s annual meeting of shareholders in New Brunswick, New Jersey, Justin Danhof, general counsel for The National Center for Public Policy Research (NCPPR), criticized Johnson & Johnson CEO Alex Gorsky’s decision to stop working with the American Legislative Exchange Council – a respected, 40-year-old national organization of supporting state legislators. “Swift and Certain Sanctions”…another model bill from ALEC. This “Act” was adopted by the full ALEC membership on June 3 2010. Assoc. Professor Angela Hawken, PhD of Pepperdine’s School of Public Policy has been touring the U.S. speaking alongside representatives of American Enterprise Institute (AEI) , a staunchly conservative think tank associated with the American Legislative Exchange Council and funded at least in part by the Koch family foundations in similar manner to the Americans For Prosperity organization. Hawken is an “expert” on topics other than swift and certain sanctions…often speaking on legalization of marijuana. April 1, 2013, The School of Public Policy and the Charles G. Koch Charitable Foundation present an Economic Seminar on Wednesday, April 3, at 12 p.m. in LC 159, with a reception to follow. School of Public Policy students Catherine Bampoky (MPP candidate ’13) and Aolong Liu (MPP candidate ’13) will present their research paper titled “The Impact of Entrepreneurship on Economic Growth.” In addition, students Ji Gu (MPP candidate ’13) and Tonghui Zhu (MPP candidate ’13) will present “Research and Development and Economic Growth in the United States.” These projects are joint work with Dr. Luisa Blanco and Dr. James Prieger. Funding for these projects was provided by the Charles G. Koch Charitable Foundation. “South Dakota’s Republican-controlled legislative Executive Board last week decided that each member of the Legislature should be a member of ALEC — the American Legislative Exchange Council. “That’s $10,500 of your money: $100 membership each for 105 South Dakota lawmakers’ memberships to a partisan group that is not looking out for the people of South Dakota. “Then, when lawmakers go out of state to ALEC conventions, South Dakota will foot the travel bill, too. Former Supreme Court Justice Sandra Day O’Connor expressed doubt Friday about the decision to take the 2000 Bush v. Gore case that resulted in the election of President George W. Bush. Read the full article -> here <- at AlterNet. It’s no surprise that money troubles and transparency issues are the result stripping public education of the accountability found in democratically elected school boards. Detroit Public Schools and the Education Achievement Authority both operate under state appointed individuals that shift millions in loans back and forth without disclosure of the transactions. Democratic Rep. Ellen Cogen Lipton paid $2642.05 to file a Freedom of Information Act request for documents that revealed the movement of funds between the two bodies. The Detroit Free Press reports that cash-strapped DPS have twice loaned the EAA $6 million dollars this school year. EAA Chancellor, John Covington, has been openly begging for money above and beyond the per pupil foundation grants it’s taken from DPS when the EAA was formed out of the 15 lowest performing schools in the district. • Rather than putting experienced teachers in these “under-performing schools,” roughly two-thirds are Teach for America students — who get five weeks of “teacher training” the summer before they are assigned, with no other certification required. • At Pershing High School, a dozen TFA students walked off the job, and I have received reports of several who have broken down in staff meetings, unable to handle the rigors of teaching. In some cases, athletic department staff are teaching students. • Reports of student abuse, including a child whose mouth was taped shut for being too talkative. DPS fares little better in meeting special needs requirements. After all the budget-cutting, school closings, charter conversions, and EAA stripping of funds — the most vulnerable students are being left in dire straights. Special needs students in DPS are becoming a larger and larger portion of the school population. The statewide average is 12 percent, but DPS is struggling to serve 18 percent — that’s 9,000 students – all while under the cruel austerity measures of emergency management. Their class sizes have doubled, yet among the expanded charter schools, only 10 percent serve special needs kids. Michigan’s kids deserve better than this. Much better. For more than a decade reports of attempts by the Brothers Koch – Charles and David – to assert their ideological branding upon American politics have been in the news. Founders or funders of nearly every ultra-conservative PAD or organization from the Tea Party to Americans for Prosperity, Americans for Tax Reform and dozens of other extreme organizations existing to advance conservatism, these two billionaires have spent hundreds of million in pursuit of that ideology. Every year the Koch’s hold “donor retreats” where America’s wealthy conservative family representatives, Congressional members and corporatists are invited to attend. At these meetings Charles and David issue marching orders for the coming year and in some cases set the agenda all the way to the next general election. Attendees generously and individually throw millions of dollars into the pot to fund the activities and goals set by the Kochs. Between 2010 and 2012 the billionaire brothers spent hundreds of millions of dollars in an attempt to defeat the re-election of President Obama and increase the GOP majority in the House of Representatives as well as secure a majority in the Senate. They failed miserably in all three as the President was re-elected and in the House Republicans actually lost seats to Democrats who continue to control the Senate. Koch Industries has been a long time member of the American Legislative Exchange Council (ALEC) and in the late 90’s when ALEC was financially strapped and on the verge of disappearing, the Koch’s loaned ALEC a half million dollars to keep the organization alive and pursuing the conservative dogma ALEC is so well known for. Since then the Kochs have supported ALEC’s initiatives such as voter suppression and voter ID legislation, deregulating the EPA and climate denial – to name just a handful of topics pursued jointly by the Kochs and ALEC. Editor’s Note: Over the next few weeks VLTP will be publishing a series exposing the American Legislative Exchange Council’s (ALEC) involvement with advancing their conservative agenda, model legislation and resolutions worldwide. We have discovered and begun to monitor the activities of ALEC overseas as they pursue developing and sponsoring legislation they favor in foreign countries. Unfortunately these activities are a two way street, in that ALEC has numerous foreign elected officials serving as full members, who come to America, meet with U.S. state lawmakers and develop new laws they favor for America’s citizens. All this will be covered and exposed through this new series beginning today – Bob Sloan, Executive Director. News of the death of former Conservative British Prime Minister, MargaretThatcher, on April 8, 2013, threw American conservatives’ idolatry of Lady Thatcher into a bright spotlight. It’s entirely appropriate, that President Obama speak to the nation upon the passing of important world leaders – especially those from our allies – and send an official delegation to their funerals. Why, however, has House Speaker, John Boehner (R-OH), insisted upon a special resolution in Thatcher’s honor, as well as upon sending his own, hand-picked representatives to the funeralin addition to the official delegation? Why also is an American presidential library-style memorial to Thatcher – money almost entirely raised in the US – in the planning stages? One might assume, given this evidence, that perhaps the “special relationship” between American conservatives and their cousins-across-the-pond is a bit more special than usual – and one would be correct in this assumption. The American Legislative Exchange Council (ALEC) has been busy in the United States for a couple of decades, writing the “cookie-cutter” bills that turn up in state legislatures all over the country – the bills which have practically identical wording in them and always seem to benefit corporations and conservative causes over ordinary individuals or community health, education and welfare funding. ALEC and its associated think tank, The Heritage Foundation – of which Lady Thatcher was patron – have recently been extending their tentacles into international territory. Recently – over most of the past decade – interesting similarities in policy and in the wording of legislation have been turning up in the United Kingdom, especially in England, as well as in the European Parliament. ALEC member organizations have sponsored British MPs as speakers for ALEC events in the United States. Young British Conservative Party trainees – across the pond, one has a “traineeship” as opposed to an internship – attend CPAC each year in droves (one wonders exactly how their ALEC sponsors explain all our 2nd Amendment frothing-at-the-mouth to them). And, there are some strangely easy-to-obtain masters degrees in such disciplines as international relations and public policy from certain sub-institutions of higher learning, offered to British MPs who slip into the US through a loophole in the law that allows them to skip registration as foreign agents if they are in the country pursuing educational opportunities. That seems to be set up to work the opposite way, as well, for American ALEC members. On the surface, none of this looks especially threatening. Neither does a special resolution in the House of Representatives, honoring MargaretThatcher, after the near-unanimous passage of which, Speaker Boehner declared the House in recess, so no other business could be transacted. That is part and parcel of his prime directive from ALEC, of course: pass no legislation favored by President Obama, even if Republicans originally proposed it and/or a majority of Americans support it. Of course, everyone knows that every dangerous iceberg has an innocuous looking tip, sticking out of the water. In subsequent articles, we shall explore the international ALEC iceberg. For each of the above-mentioned issues into which ALEC has insinuated itself on the international stage, we will trace contacts, examine timelines and connect the dots between ALEC, its subsidiary organizations and shells, its members – both individuals and corporations – and the Members of Parliament in the UK and the European Union. MargaretThatcher, deceased though she now is, was one of the architects of the structure built over the years to advance international corporate interests over the interests of either national governments or the social well-being of the people governed. The most important point here is, unless registered as foreign agents, Americans influencing British and European domestic policy, are committing illegal acts. If foreign nationals attempt the same in the United States without registering as agents of a foreign power, they are also committing illegal acts. Joined by twenty-eight of his colleagues, Michigan House Rep. Bruce Rendon (R-103) thinks he has the solution to preventing gun violence among children. This morning he introduced a resolution (HR – 104 of 2013) that encourages public schools to adopt a video training program developed by the National Rifle Association called the Eddie Eagle Gun Safe Program. Rendon proposes the training start at the Pre-K level, but says it should start no later than Third Grade. View the video here. The program has been around for a couple of decades, and has yet to prove to be effective in any way. Paul Helmke, President of the Brady Campaign to Prevent Gun Violence, cites a 2004 study conducted by the American Academy of Pediatrics which found that, although children could memorize the video, they did not put to use the skills in real life tests. Michigan’s Republican lawmakers have proven they have little regard for science or facts when it comes to legislating, but when their NRA report cards are on the line, even the occasional Democrat can have an attack of willful ignorance.